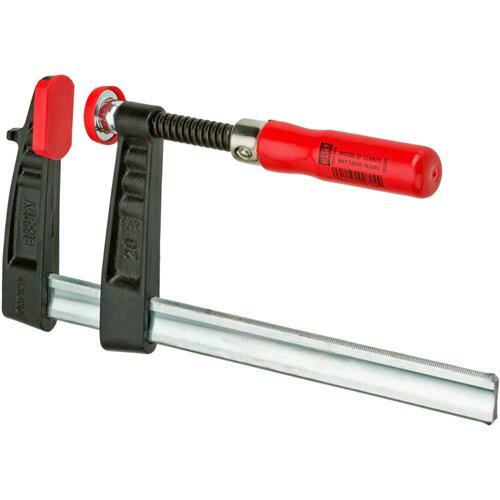 Nine times faster than a standard C-clamp, Bessey's Regular Duty Tradesmen Bar Clamp sets up quickly and likes to hold on. The choice of professionals worldwide, this fast-action sliding clamp features a profiled rail and I-beam design that virtually eliminates flexing and bending for straighter and truer work pieces. An innovative, non-slip locking device won't budge until you say, and a zinc-finished, drawn rail operates smoothly for easy clamping. An oversized, ergonomic wood handle offers maximum power and comfort so you can really crank down. Made of galvanized metal, the Tradesmen will never rust or corrode. Bessey's cold drawn profiled steel rail offers total control over the workpiece. The C-Clamp is corrugated for extra gripping strength, and coated with a protective powder to eliminate corrosion. A uniquely designed setscrew is permanently molded into the sliding arm, and interlocks with serration on six sides of the rail provide the ultimate non-slip grip. The Bessey Tradesman: state-of-the-art clamping technology for perfect projects, every time.